Sometimes, it’s good to live on the edge and throw your plans out the window. A few days ago, we did just that. The result? We encountered the type of travel we’d been dreaming about: raw, challenging, and unforgettable. Our original schedule had us sprinting to Darjeeling so we could munch on scones and wander amongst the tea fields for a few days. As we shared our intentions with a savvy Guwahati resident, he suggested we divert our attention to Cherrapunji. Loved by locals, this unique township and epic natural playground was rarely explored by international tourists. It sounded like North East India’s best-kept secret. We were sold! Jumping in our Landy, we made our way up towards the Khasi Hills (a hop, skip and jump away from Bangladesh). During our ascent, we became increasingly aware of the strong military presence. It was a little intimidating, so we smiled our way through it and carried on as quickly as possible. Before long, the surrounding landscape took on a different aesthetic, one which was reminiscent of the Scottish countryside or New Zealand’s south island. Having climbed 1900m, we’d finally reached the top of the v-shaped mountain plateau. New air filtered through our lungs. It was crisp, fresh and invigorating, especially compared to sea level India. As we continued our journey along the top of the plateau, the towns flying past our windows became simpler – more tribal. 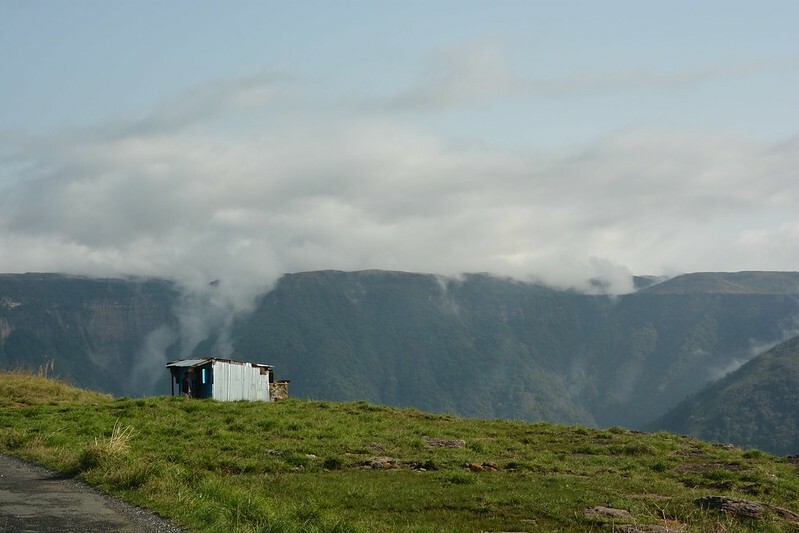 So it seemed, we were now in the land of the Khasi people…and boy were they tiny. Most of the villagers had to be less than 5ft tall and their faces were strikingly intense. The elderly seemed to hide their stories in the deep, leathery creases around their eyes. They were hypnotising. From what we could tell, most of the villagers (men, women, seniors and many children) spent their days working on subsistence farms. Considering the Khasi Hills were literally the wettest place on earth, it must have been a tough existence. Their miniature homes looked well-and-truly battle worn, as though they hadn’t quite withstood the wild thunderstorms and relentless rain. As our stomachs started to protest their hunger, we came across a well-kept country cottage which stood out like a royal palace. Much to our delight, it was called “Café Cherrapunjee” and it was open (everything else up the mountain had been closed due to a community strike). Not only was this café a top-rating restaurant on Trip Advisor, it also offered a hearty menu, spotless toilets and comedic ambient music (ABBA, country and easy-listening saxophone). We were happy. Too soon, it was time to jump back in the Landy and tackle the last stretch of road leading to the centre of Cherrapunji. The sky suddenly awoke from its rare slumber, swirling threateningly above our heads and getting darker by the minute. The dusty blue clouds drifted towards the heavens from the depths of the valley, making it look like a steaming witch’s cauldron. It was an eerie sight. To make things just that little bit creepier, hundreds of crosses and gravestones decorated the hills around us. The weathered shops and rickety homes brought little warmth to the situation, as they were locked up tight due to the strike. It felt like ghost town…or a mad set for a zombie film. Finally, we caught sight of our accommodation, the Kutmadan Resort. A beacon of comfort, respite and a little luxury, it also had front row seats to the vast plains of Bangladesh. Surely this was the best panoramic view in town, perfect for a brag-worthy sunrise shot. But, for now, it was time to hide under a cuddly blanket and fall asleep as the storm took hold of the night. Ground-shaking thunder, sky-splitting lightening bolts, pounding rain…it was actually kind of magical. As we woke up to a beautiful day, blue skies and all, we were ready to complete our journey with a visit to the Living Root Bridges. 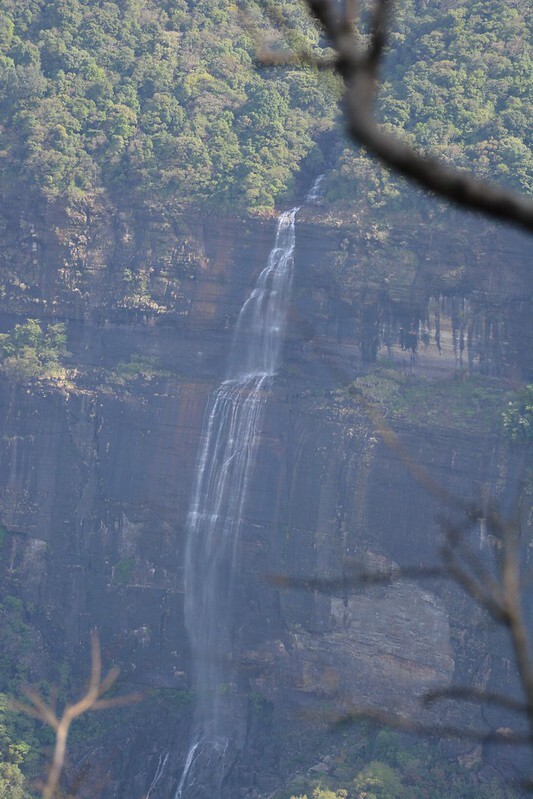 While they’re the star attraction of Cherrapunji, a plethora of experiences await the curious traveller, including: caves, zip-line challenges and countless waterfalls. Due to time constraints, we chose to stick with the big ticket item. Descending into the depths of the valley, we eventually reached the startline of our walk. Did I mention the track was made completely of stairs? There were thousands of them, and they’d obviously been designed for the locals’ petite feet. 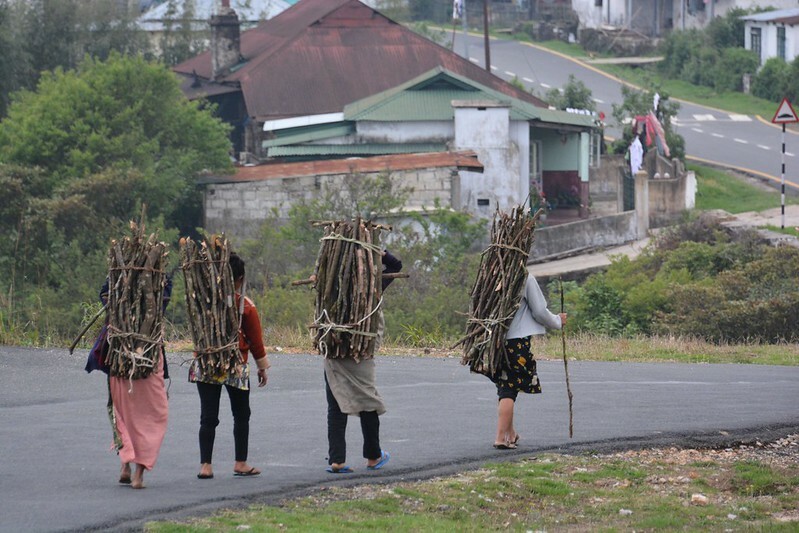 Indeed, a number of villagers’ passed us at breakneck speed, despite having serious cargo on their backs. 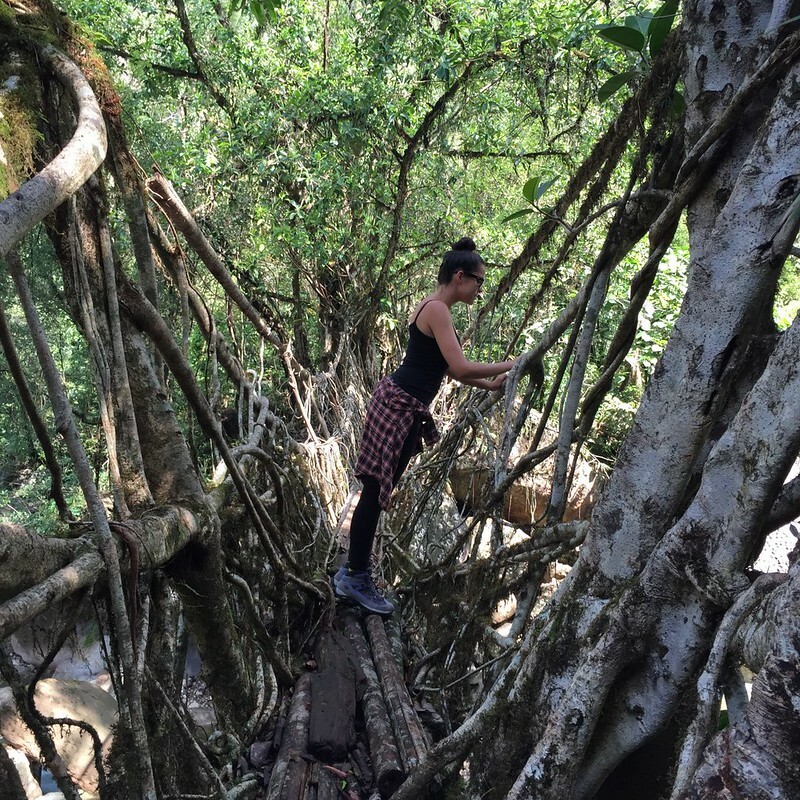 As we completed the last few steps and caught our first glimpse of the Living Root Bridges, we quickly bumbled about for our cameras. They were more spectacular than we’d imagined. Over hundreds of years, their spaghetti-like roots and branches had been trained into a natural, everlasting masterpiece. We couldn’t wait to take a closer look and then wash the sweat and grime away with a dip in the freshwater stream below. This place was heaven and, in that moment, it was ours. What goes down, must come up. 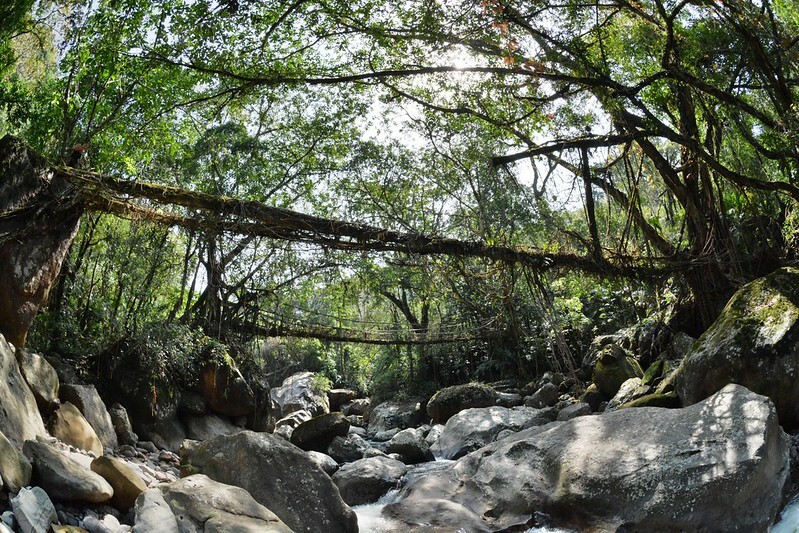 While the journey to Cherrapunji and the Living Root Bridges was just as riveting as our final destination, we had a feeling the trip back was going to be a little more strenuous. Oh well, it was totally worth it.